Cook and drain tortellini as directed on package. Rinse with cold water; drain. Cut up large pieces in Giardiniera vegetable mix. 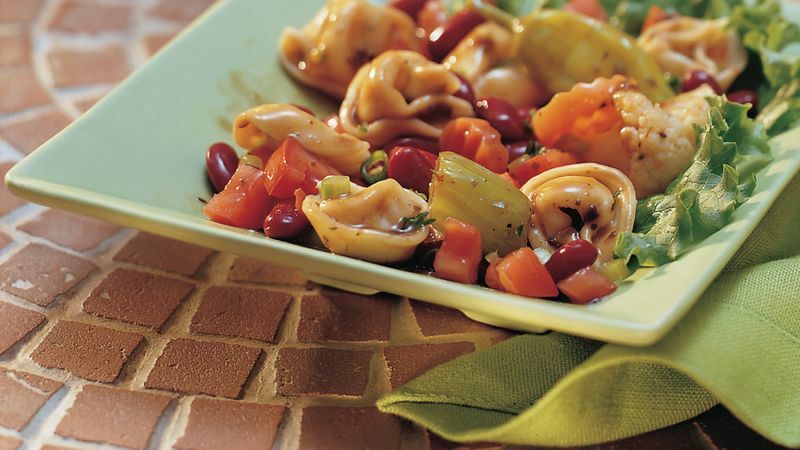 In large bowl, mix tortellini, vegetable mix and remaining ingredients except dressing. Add dressing; toss to coat. Serve immediately, or refrigerate up to 2 hours. The Giardiniera vegetable mix is a combination of marinated vegetables that includes cauliflower, carrots, celery and bell pepper. Look for it near the pickles in the grocery store. Cook the tortellini up to 24 hours in advance. Toss with a little vegetable oil, then cover and refrigerate until you're ready to make the salad.